Invited to participate in the Gator Engineering at State College of Florida program and to become part of the Gator Nation! Participate in a Gator Engineering at SCF Information Session. Confirm participation in Gator Engineering at SCF by May 1. Complete required paperwork, immunizations, course placement testing and make any necessary changes to FAFSA. Receive academic advising for appropriate fall registration. Attend Gator Engineering at SCF orientation as well as SCF traditional orientation. Get a head start on courses at the SCF Venice campus during the summer B term is desired. Take courses at SCF Venice as a SCF student. 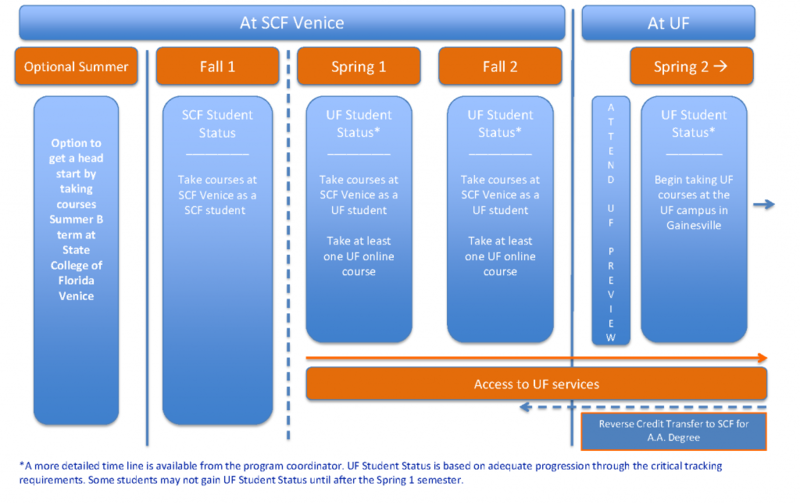 Take courses at SCF Venice as a University of Florida student (if UF admitted). Take the online University of Florida Fundamentals of the New Engineer course taught by a University of Florida faculty member. If desired, take courses at SCF Venice. Begin taking classes full-time at the University of Florida main campus in Gainesville! Graduate from the University of Florida with an ABET-accredited Bachelor of Science degree!